Looks like the South is the new battleground for civil rights . . . civil rights for White voters and citizens who’ve been discriminated against. Over a year ago, a top Black prosecutor in New Orleans was found to have discriminated against Whites in hiring and promotions. Now, it’s White voters in Mississippi who’ve been disenfranchised in the quest to elect Black public officials. So, will there be “We Shall Overcome” marches, protests, and the like. Don’t count on it. A federal judge has given broad power to an administrator to run Democratic elections in Noxubee County and banned Ike Brown and his associates from having a role in running elections. U.S. District Judge Tom Lee issued his remedies Monday to satisfy his June 29 opinion that black political leaders in Noxubee County violated the 1965 Voting Rights Act by discriminating against white voters. . . . 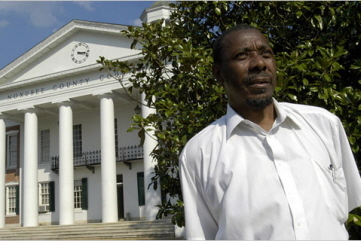 The U.S. Department of Justice brought the federal lawsuit, the first of its kind in the country, accusing black political leaders of discriminating against white voters in the majority black county. . . .
Lee appointed former state Supreme Court Justice Reuben Anderson, the first black to serve on the court, as superintendent of elections for all Democratic primaries and runoffs through Nov. 20, 2011. Both the Justice Department and attorneys for Brown and the county Democratic Executive Committee had earlier agreed on Anderson’s appointment. . . .
Lee also said Brown cannot be present in the circuit clerk’s office two weeks before any primary election except for matters pertaining solely to him or his immediate family. Brown also was ordered not to be present in polling places unless he is voting, has been appointed as a poll watcher for a candidate, or Anderson has appointed him as a poll official. In his June 29 opinion, Lee said Brown violated federal voting laws by discriminating on the basis of race, by issuing directions to count the absentee ballots of white voters differently than the absentee ballots of black voters. Brown said Monday he has no regrets for his part in overthrowing Noxubee County “apartheid.” He said the county had been run by a white minority for decades. Now, it’s time for the Justice Department to examine Muslim disenfranchisement of non-Muslim voters in Dearbornistan, Dearbornistan Heights, and Hamtramckstan, Michigan. Black? White? You struck gold. Is Federal Judge Tom Lee black or white? In the post, references are made to the races of those mentioned except Judge Lee. As for the story – It is wrong, just plain wrong that race is used to disenfranchise anyone. Though I would like to know how does one know the race of an absentee voter? Maybe part of the resolution of this issue is to stop whatever practice there is that allows one to know the race of a person who uses an absentee ballot. Could be a vestige of past discrimination. I can’t say it enough, it was wrong then and it is wrong now. Perhaps EVS can shed some light on this activity in his AOR (area of responsiblity)? DS readers know ICE Deputy Special Agent in Charge/New Orleans Kyle Barnette as EVS. Barnette (EVS) regularly posts from government computers when he is supposed to be working. Barnette is being paid $120,000+ a year to blog on this site? EVS has admitted to driving his government owned vehicle while texting on his blackberry. EVS texts for hours as he commutes the 200 mile round trip between home and office. EVS, is not the exception to the rule. EVS is the typical, arrogant Marcy Foreman appointed manager in ICE Office of Investigations. If the country becomes unstable due to economic crisis and immigration run amok, I look for the blacks in the delta to start claiming the land for themselves and driving out the few remaining whites, as they are in Zimbabwe and South Africa. Already, from Memphis down to Jackson, MS and into Louisiana, it is almost like a black country. You know the Mexicans are doing this, too. They already stole Bob Dornan’s seat in CA. Birds of afeather flock together.